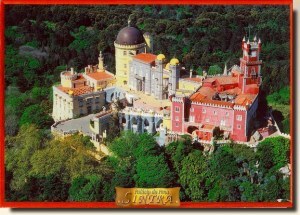 The Pena National Palace of Sintra (Palacio da Pena), one of the seven wonders of Portugal. Palacio da Pena. Sintra is a town in Sintra Municipality in Portugal, located in the Grande Lisboa subregion and the Lisbon Region. The town is a UNESCO World Heritage Site on account of its 19th century Romantic architecture. Sintra has become a major tourist attraction, with many day-trippers visiting from nearby Lisbon. Attractions include the fabulous Pena Palace (19th c.) and the Castelo dos Mouros (reconstructed 19th c.) with a breath-taking view of the Sintra-Cascais Natural Park, and the summer residence of the kings of Portugal Palà¡cio Nacional de Sintra (largely 15th/16th c.), in the town itself. The Sintra Mountain Range, one of the largest parks in the Lisbon area, (Serra de Sintra) is also a major tourist attraction.